The Major Arcana or the Trump cards of the Tarot deck are immediately recognized these days having a place in movies, graphic novels and popping up in art of all kinds which means they are firmly established in the collective or shared mind of Earth World cultures. The word arcana in terms of the Trumps implies there is more to the card than meets the eye, there is a mystery involved with the meaning of the simple picture on pasteboard. The 22 Major Arcana of which 21 are numbered and 21 named represent impersonal processes or laws related to the cycle of manifestation and occultation. Now you see it. Now you don’t. So where do we start? How about the Magician. When counting we start with the number one. This works well for me in Tarot. First we note where the central character faces which is to the left of the viewer. Next we notice the items on the table in front of the Magician. We see the tools used by one who does tricks or sleight of hand. In the hands of the Magician are a ball and a wand. 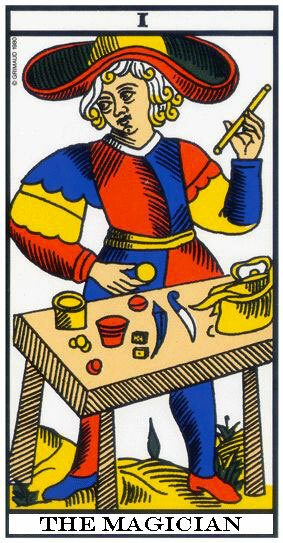 The costume of the Magician is asymmetrical. His hat is in the shape of the sign of infinity, a lemniscate. The Magician changes things, the positions of the objects on his table and minds. When reading Tarot in a linear spread, i.e. as a fortune telling device the card the Magician looks at, he is changing The card behind the Magician’s back can indicate a situation already altered.